There are a number of online destinations to find recipes, including Epicurious, All Recipes, Bing and FoodNetwork.com. But a new company is trying to disrupt this arena with a powerful semantic food search portal. 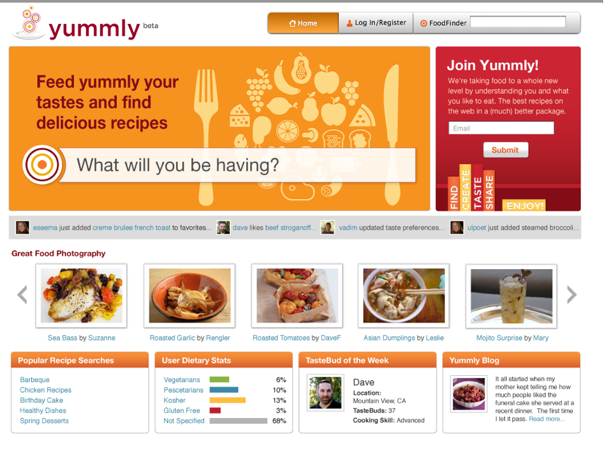 Yummly is launching a new food search site to find and share over 500,000 recipes on the web. Similar to other recipe sites, Yummly aggregates recipes from around the web. But what differentiates the site is its powerful filters and search features. Not only can you filter results by type of food, course, and ingredient, but you can also break down recipes by diet, allergy, nutrition, price, cuisine, time, taste, and sources. You can also edit and save any recipe with ingredient substitutions and adjustments based on your preferences; Yummly will recalculate the recipe to reflect the new ingredient amounts. So if you wanted to cut a recipe down to one portion, Yummly will recalculate the ingredients you need for a smaller version of a dish. And Yummly calculates the nutritional value for each recipe, showing you the breakdown of calories, fats, proteins, and carbohydrates. Users can also import and add their favorite recipes from other websites and save them in their Yummly recipe box. The site also ‘learns’ what users like to eat from their recipe searches and then offers them customized, taste-specific recommendations based on their preferences. Founded in 2009 by former StumbleUpon and eBay employee David Feller, Yummly could be one of the more powerful food recipe search engines in the market. The site also has an impressive list of angel investors and advisors, including Michael Dearing, Harrison Metal Capital; Jeff Jordan, CEO of OpenTable; Bruce Shaw, President of The Harvard Common Press; Bill Cobb, former President of eBay, and a former executive of PepsiCo and Yum Brands; Brad O’Neill, CEO, TechValidate and founding investor of StumbleUpon; and Justin LaFrance and Geoff Smith, co-Founders of StumbleUpon. The biggest challenge Yummly will have is drawing traffic to its site. But once foodies start using the powerful search portal, I have a feeling that they may never return to other recipe sites.